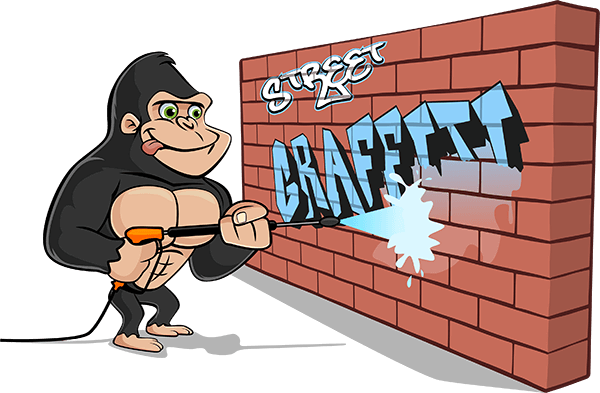 Penticton Graffiti Removal | Gorilla Property Services | Call Us Now! With its mild climate, easy access to a downtown district and population of just 33,250; Penticton is popular for a short or long term breaks. A small city with a wholesome reputation might not seem prime for graffiti but that just isn’t true! Penticton graffiti removal is necessary in cities great and small. The quiet streets and alleys of Penticton are prime spots for street artists. “Taggers” work best when undisturbed and what a better place to be alone than the streets of Penticton at night. Penticton graffiti removal is not just about getting rid of graffiti’, but reducing the possibility of it happening again. Our Gorillas watch your back! Regularly patrolled properties means clients can sleep easy. This is important for two reasons. The first is a deterrent. Graffiti artists know an area is being watched they are more likely to pick an easier location. The second is removal, where fast action is crucial. Sitting tags, over time, allows the paint to bake into surfaces. This makes removal more difficult and, oftentimes, a lot more expensive. Some tags leave only option; colour match the paint, prepare, prime, and paint over the graffiti. Gorillas can keep matches on file in case they are needed again. Gorillas take care of your stains with eco-friendly, non-corrosive cleaning compounds and elbow grease. Our Gorillas use tricks of the trade to give your property the best results possible. Our Gorillas will use everything in their arsenal to remove even leftover shadowing, leaving your property looking like new.